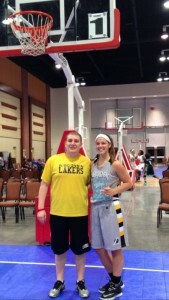 Congratulations to 2015 5’10 SG Taylor Higginbotham on her Verbal commit to NCAA D1 Western Illinois University. The 5’10 SG from Germantown High School has been a member of the Wisconsin Lakers the past two season playing both for Lakers White. Taylor will join fellow Laker Alumni Michelle Farrow, Faith Lois, and Ashley Luke who are currently on the Leathernecks roster. From the moment Tay first stepped on the court with the Lakers you could tell she was special. Her dedication and drive to improve was impressive to watch. On the court she never took a play off on either end of the floor. Everyone notices her shot, but what gets over looked is her tenacious defense and rebounding skills. She is the ultimate teammate who always puts the team first. All of us at the Wisconsin Lakers are so proud to have had the opportunity to coach such a Great kid. Congratulations Tay your Laker Family is very proud of you. Taylor makes the 4th player in the Lakers 2015 class to accept a Full Ride Scholarship to an NCAA D1/D2 School. We will have some more 2015 commitments shortly so please check back.